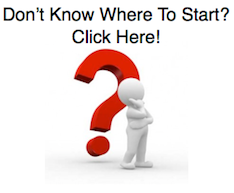 So, what if I show you now how to get started on your personal development plan, even for your private goals? When I was starting a new job a few years ago, I got really devoted, invested a lot of time, and was loving it. About 7 months later, it was that time of the year again to think about New Year’s Resolutions. And mine was clear for me: Exercise. Exercise to wind down after work, to de-stress and to avoid weird moods when not doing enough exercise. So, like a lot of people, I told myself that I will be doing more sports in the New Year. c. There was little personal awareness and attention to the topic. And then I got angry. All this planning being done at work for all these different topics, but when it comes to my personal interest, I am not able to do the same? Well, I guess it was not a question of capability. How did I manage to get out of that situation? After this ‘discovery’, I researched a bit and sat down to work out my personal “starting block” strategy. And with some fine tuning later on, I came up with a recipe which works for me up to today. No miracle steps, just steps, one after the other. #3: Manage your fear, define a personal driver & be conscious. I will explain to you one by one. Once you have established your first version of your personal development plan, or simply just written down some objectives around New Year’s Day, it can be difficult to actually start and take action. One easy way is to define your goal as clearly and realistic as possible. If needed, print out your goal and place it somewhere where you see it on a very regular basis. I prefer to do it this way most of the time, but I also use an app – I recently discovered, which is called Lift. Previously, I also used 43 things, but I somehow prefer the new app. Up to you to decide. Now, first things first. This does not mean that you need a planning for each goal there is. A planning is useful for difficult and complex topics where you do not really progress without. If you would like to participate for the first time at a marathon, for instance, it is a great idea to do a planning for that. What should be the minimum components of a planning? You can use a simple spreadsheet or some tracking software. Personally, I prefer to personalise my planning in a spreadsheet, as most of the tracking software come at a cost and are complex. A question of personal preferences, I guess. #3: Manage your fear, define a motivator & be conscious. 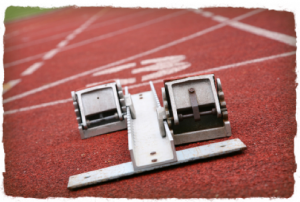 This last piece of the starting block strategy is focusing on your personal mindset. The best written software filled with information does not help you, if you do not have the mindset to get going. So, how can you do it? Step 1: List your fear and obstacles to achieve your goal. Start a mind map today and look at it again next week to add more. Once you have a clear idea of your obstacles, it is usually easier to deal with it. Step 2: Come up with a personal driver, if you do not already happen to have one. This can be a life motto or a famous quote out of a song or movie… Ideally, it should relate to your current situation in your life, linked with your dreams and your goals. Step 3: Use your personal driver to be more conscious about your every day life. There is a lot of distraction out there, try to focus on the core things, at home and at work. In case I lose traction and I need motivation, I often refer to the Four Hour Work Week book and blog by Tim Ferriss. It is a great source with many valuable tips! In case this is also something which happened to you, what was your way of dealing with it? If you are stuck right now, feel free to test my strategy. Let me know how it turns out. Finally, I invite you to take a quick look at this 4 min (rather controversial) TED talk on keeping your goals as a secret. *Note: The SMART (Specific, Measurable, Achievable, Relevant and Trackable) technique can also be used. I prefer the above formula as it links directly to the purpose and the objective itself does not become too complex.